Today we are sitting in Spokane, WA. Our New friends Mike and Sophia are graciously letting us park in front of their house and use their electricity too keep us and the dogs cool. The plan wasn’t to be in Spokane long, but plan constantly change when you travel full-time in an RV. 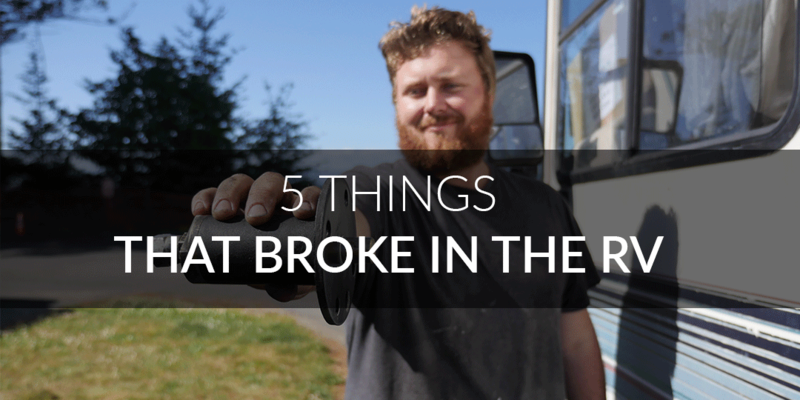 This is our saga of the things that broke in the RV in the first two months of full-time travel. 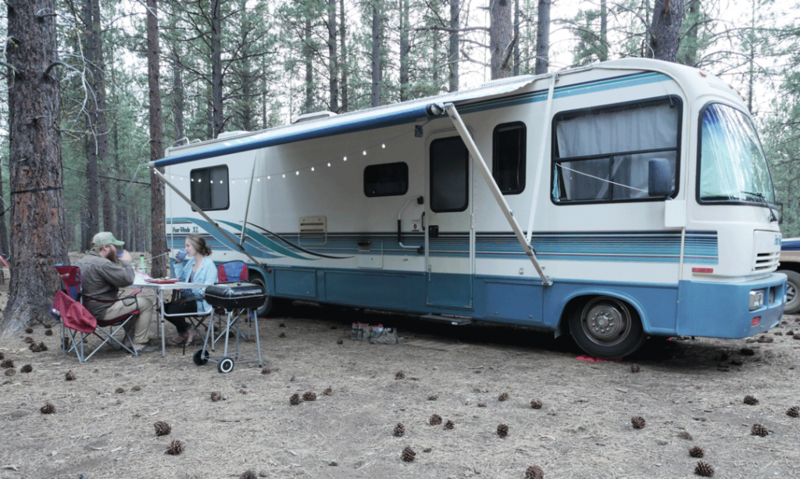 Let’s back up to when this traveling full-time in an RV trip started in May. We made our way down to Atlanta, GA to pick up our friends, Ed and Kristen, then carried on across the country shift driving and only stopping for gas. Well, things were going great so far, and I was feeling good about the performance of the RV having recently changing the alternator, battery, spark plug wires, brake pads and numerous other little things. About half way through Alabama around 11 pm, I am sleeping in the bed in the back, and Ed is driving when I am suddenly woken up by some swerving and the sound of something being tossed around under the RV. Apparently a 18 wheeler had just blown a tire in front of us. I went to the front, everything seemed to be fine, so we carried on. A few minutes later another trucker started blowing his horn at us and we realized we had lost all the running lights in the back of the RV as well as the tow lights on the Bronco. We pulled over at the gas station to check our the situation. Turns out that some scrap tire caught a few wires in the undercarriage and ripped them to shreds. So now we are sitting there with sparking wires under the RV and most of the lights not working. With a headlamp, some extra wire, electric tape and but splices, I get to work under the RV, and it only takes 10 minutes or so to get everything back in order. Great, wires are connected, but still no lights. The next logical conclusion is a fuse. I checked the inside fuse box and sure enough, the spiked voltage from the sparking busted the one that controls the rear lights. No problem, I happened to bring a whole box of extra fuses. All in all the process was about 20 -30 minutes of diagnosing and fixing, and we were on our way again. The longest part of this first mishap was getting out of a conversation with the resident elderly gas station local. He was a great guy, but he would have talked till the sun came up! The hot water heater breaking is really aggravating as I seemingly had this thing fixed up and working fine. We pulled up to the Calistoga RV Park and got settled in. We were excited for the few days of wine tastings and exploring vineyards. This RV park had showers, so no hot water there wasn’t a big deal, but it’s nice to do some dish washing with hot water. Well, I went to flip the switch and heat the water tank and nothing happened. I checked the battery and all the connections with my test meter, and we seemingly had proper voltage all over. I had concluded it was most likely just a faulty switch, so we disconnected it and tried to start it by touching the wires, nothing. Next thought was something in the ignition system, and this is where the story takes a bad turn. We decided that we could make it by using the showers inside the RV park in Calistoga and Yosemite, so we wouldn’t have to worry about it until we got to Redding. We decided to take our rig over to the Camping World just outside of Redding. They said this wasn’t a big issue and most likely would take less than an hour to fix. 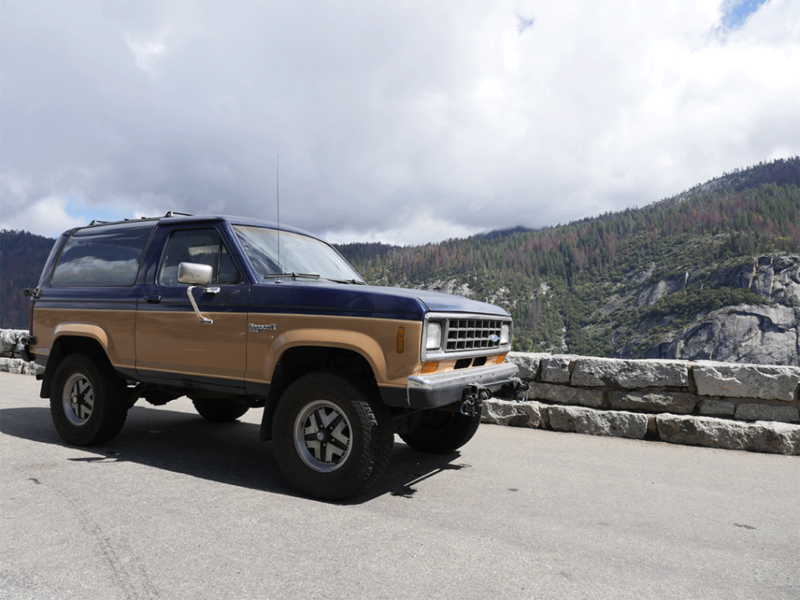 After making an appointment the day before for 9 am, we decided we would drop the rig off and run a few errands with the dogs in the Bronco II. Well, we dropped it off at 9, and by 11am, no word. We showed back up at 11:30. After being told it would take less than an hour, we figured 2 ½ hours would be plenty of time to correct the issue. I headed back to the service counter and found the service manager I dealt with earlier that morning and was told the mechanic has spent half and hour searching for the electric side of the water heater, which there was none, and hasn’t been able to find it. Although a simple phone call to me could have rectified this issue, they decided to not reach out to me and blamed me for the fact that I mislead him about the issue. Great, so they have spend half of my expected 1 hour of service time chasing something that doesn’t exist, and we are nowhere. After clearly explaining my instructions to them about exactly what was wrong again, they said they would get to it. We decided to hang in the parking lot thinking 30 more minutes won’t be too bad. Well, after an hour of waiting and hearing nothing, I walk back in and asked what the deal was. Apparently, all the techs go on lunch at noon. I have no problem with people getting their lunch break, but the service manager failed to mention this when we said “30 more minutes.” So now I am told they will work on it after lunch around 1 pm or so. After waiting and waiting some more, I finally see our rig being pulled around at 3pm. I walked inside to pay our overpriced service rate and headed out. The re-lighter had gone bad. I have now gotten myself very familiar with the hot water system to avoid this fiasco in the future! So the plan was to go from 100 degree Redding, CA towards Bend, OR where the high was only in the 60’s and 70’s. That trip involves crossing a mountain range and a few long passes, so obviously we needed a fully operational rig. Well, climbing up that first pass we were greeted with the engine missing, backfiring and really struggling uphill. Luckily, we made it all the way to Bend, but we had to take it easy. Having changed the spark plug wires just before the trip, I didn’t think that was the issue, but it sure did sound and feel the same. Fortunately, it was the wires, but I figured while I was at it, I would change the spark plugs, rotor and distributor cap. All together these parts cost $90 and just a couple hours of labor (thanks to one of the old spark plugs breaking inside the head). After fixing up all of this in Bend, it ran like it should all the way to Portland. So we left Portland, all is well and the RV is running smooth. We head to Port Angeles, WA just outside of Olympic National Park. It was around a 6 hour drive. On the way there, I noticed the Auto Park light started flashing and then stayed on. After that point we started to smell burning rubber, but we couldn’t figure out the problem and carried on. 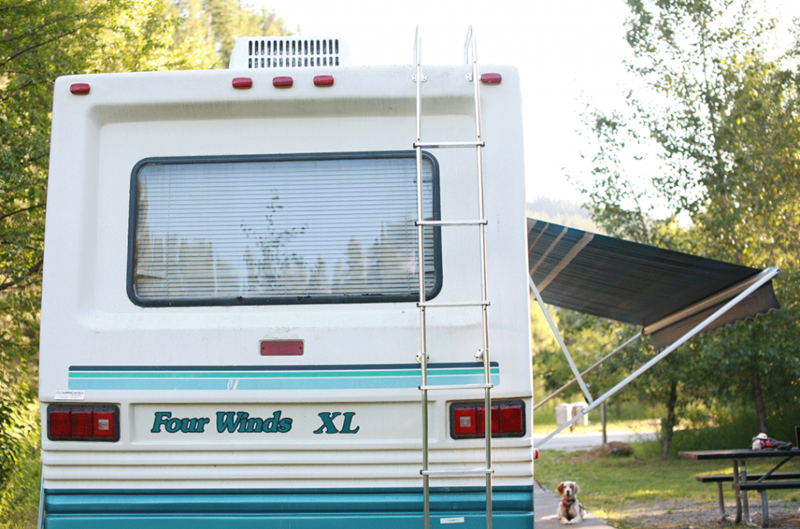 When we arrived at the campground in Port Angeles, I put the RV in park, and we kept rolling. After a few google searches I found the culprit was the Auto Park System and could be a variety of issues. This is the system that applies the parking brake when you shift to park as well as the e-brake. We ended up grabbing a spot about 30ft. 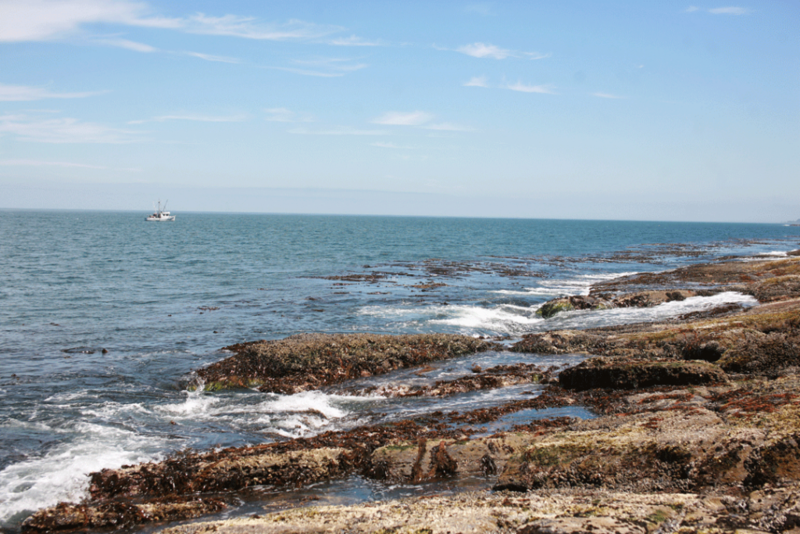 from the cliff down to the ocean. The chocks would have to hold us still for the time being. Luckily, I found a guy through the irv2.com forum that knows all the ins and outs of this system, and he was nice enough to help me diagnose the problem and send me a few schematics to disassemble the system. Apparently, while we were driving, the system malfunctioned and the parking brake applied, hence the burning rubber smell. We shipped actuator off to this fellow to rebuild for just $90. What an excellent deal compared to the $1,200 I would spend on ordering a new part. This meant we were stuck at the campground for about 5 or so extra days, but being stuck waterfront with views of Canada wasn’t all that bad. This one is going to be short and to the point as it is not fixed yet. A few days ago, here in Washington State, we turned the generator on and were greeted with a little smoke coming from under the couch. Not sure what the issue is, but now that we have a spot to stay for a few days, it’s time to figure it out! We will be sure to give an update on it when we are done. 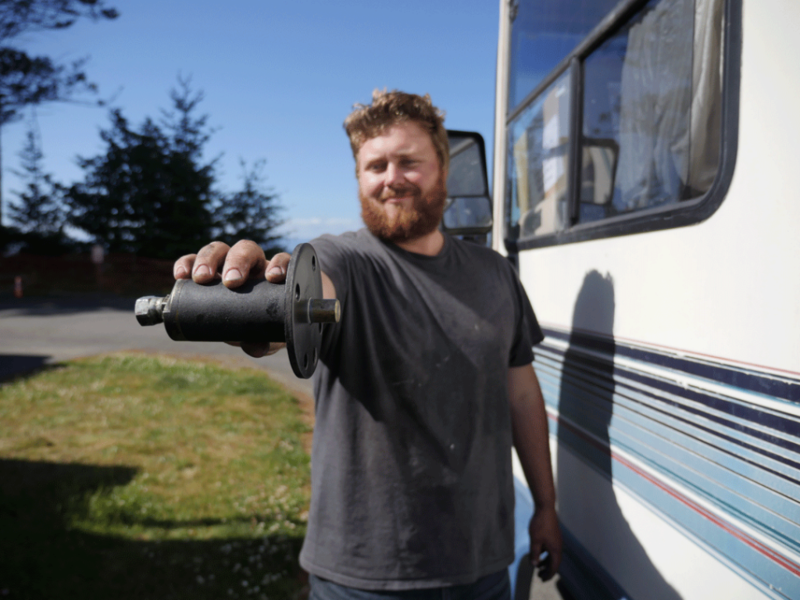 Owning n RV is an endeavor of constantly fixing something. It helps to be handy and knowledgable to figure stuff out. I’m always fixing something on ours. Blessings to you on the rest of your journey. Hi! It sure is! Luckily, Luke was able to get the parking brake and generator fixed yesterday, so we’re on the road with nothing broken… for now! 🙂 Hope yall are doing well!